If you ever want to test your balance and core strength, this obstacle, one of the 13 (or was it 14?) 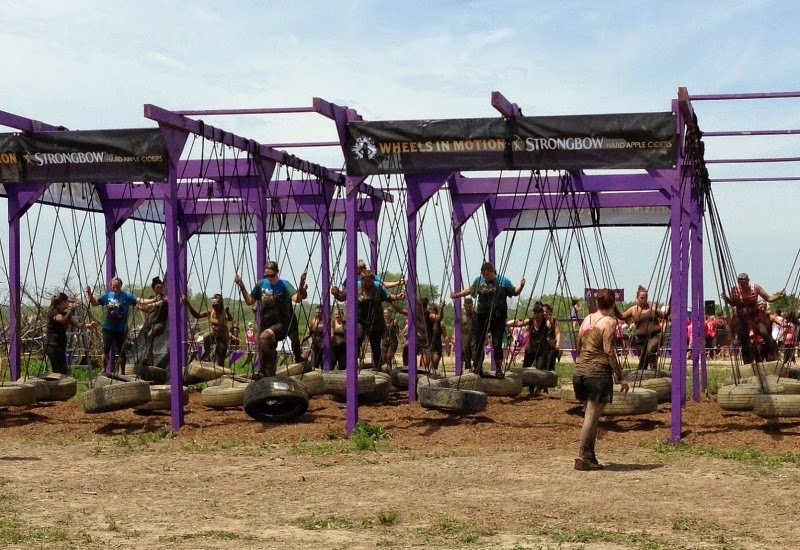 obstacles Mudderella participants faced earlier today on the Chicago course, is where you can do it. Wheels in Motion looks like something you'd find on a playground--and probably was a recess activity you'd leap at doing when you were eight. But maybe it's the added height and weight I've acquired since I was in elementary school (and the fear of falling I've gained as I've grown older and have more distance between my body and the ground): Crossing those tires is challenging. More than I thought it'd be. Step too quickly and you're flipping the tire; step too slow and you're freaking about the line forming behind you while trying to grab the rope for your next move. Or at least that was what rolled through my brain on this obstacle that looked easier than it actually felt. Unless that was just my core telling me I ignored it all winter. Every time I thought I had the tire-crossing figured out, between engaging my core, getting my balance in check and finding the sweet spot on the tire, I'd be thrown for a loop. The tire would start to flip, I couldn't reach the rope, and I felt like the one fool up there who could make a seemingly less daunting challenge, compared to the mud pools we tackled earlier in the course anyway, that much more difficult. But hey, that was just part of the fun, challenge and skill of Mudderella--and I'd do all again. When's the next race? What a great race to be part of!!!!! I wonder if they still host this in Chicago....I'd love to suggest it to my personal training clients!